TOKYO	- 29 Sep 2006: IBM (NYSE: IBM) announced today that it has collaborated with Xing Incorporated, a subsidiary of the Brother Industries Ltd., to engineer, design and develop two new wireless karaoke portable controllers -- "Kyoku-NAVI II" and "Kyoku-NAVIs" -- which will be available in Japan from Xing starting in early November. 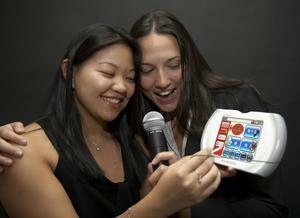 Engineers and designers at both Xing and IBM Technology Collaboration Solutions worked in collaboration at IBM's Yamato Laboratory to create two kinds of wireless karaoke portable controllers. Each controller replaces the conventional thick karaoke song catalog, and contains tens of thousands of songs listed by singer, song and category. In the past, to choose a song, karaoke customers had to go through the thick catalogs to find the song he or she wanted to sing, type in a number listed on the catalog to a remote controller and call up a song. The new wireless karaoke portable controllers significantly ease the burden of searching and entering songs with a touch screen panel and various search options. It also allows each customer to register favorite songs respectively. directly from the touch screen panel. The new controllers allow non-Japanese speaking customers an option to do a song search in English, Chinese or Korean. For the past 2 years, IBM has been collaborating with Xing, located in Nagoya, Japan, to design and develop karaoke controllers for Xing. IBM contributed its deep technology and engineering expertise, a history of design experience and manufacturing connections to the joint project. A portable form factor, advanced power management, ruggedness and faster search capabilities using IBM DB2 Everyplace (DB2e) -- which provides data management services on embedded devices -- led Xing to choose IBM to jointly develop these new versions of karaoke portable controllers. A pioneer in introducing the new business model in distributing karaoke music content via the network in Japan, Xing has been at the forefront in bringing new services and solutions to help karaoke bars and restaurants improve business efficiencies and customer satisfaction. To make the karaoke experience more enjoyable for customers, the controllers offer a wide array of search functions, such as "history search" which displays a list of songs selected from the same controller in the past, "at-that-time search" which displays songs in a chronological order from a keyword, such as buzz word and news, "album-single search" which allows users to search by viewing CD jacket images, and "this-song-is-amazing search" which allows a partial video preview. The key feature of Kyoku-NAVIs is the remote controller feature, that allows karaoke customers to select a song by name, by artist or from several genres from the controller's screen wirelessly. In addition, karaoke customers can access a variety of content such as promotional videos and information on sports through the controller's screen. Kyoku-NAVI II has all of the above features and also allows karaoke customers to order food and drink from its touch screen. Both controllers are shock resistant and water-proof. To enhance scalability and stability, a wireless LAN is incorporated into the new controllers, a first for the karaoke industry, allowing high speed transmission of songs and data in volume -- updated on demand within the controllers themselves. "Xing is a great example of how a company can collaborate with IBM and access our deep history in engineering, portable device hardware and software development," said Rob Thomas, Director, Asia Pacific, IBM Technology Collaboration Solutions. "The collaboration efforts of Xing's innovative idea of replacing thick song catalogs with these new portable karaoke controllers, and their deep history in the karaoke industry, combined with the design, engineering and technology history of IBM has produced a device that will allow karaoke customers to be freed from going through thick song catalogs and burdensome song number entry, making each karaoke customer's experience more enjoyable than ever before." IBM and Xing Take Karaoke High Tech: IBM announced that it has collaborated with Xing on the design and engineering of two new Xing-branded wireless karaoke controllers. The controllers allow users in Japan to digitally search for thousands of songs by artist name or title -- eliminating karaoke song books forever -- as well allow users to place food or drink orders directly from the touch screen panel. IBM and the IBM logo are trademarks or registered trademarks of International Business Machines Corporation. For a list of additional IBM trademarks, please see www.ibm.com/legal/copytrade.shtml. All other company/product names and service marks may be trademarks or registered trademarks of their respective companies.